WELCOME to my Bead Soup reveal! My partner Andrea Morici sent a fabulous mix of colors and materials with which to work. 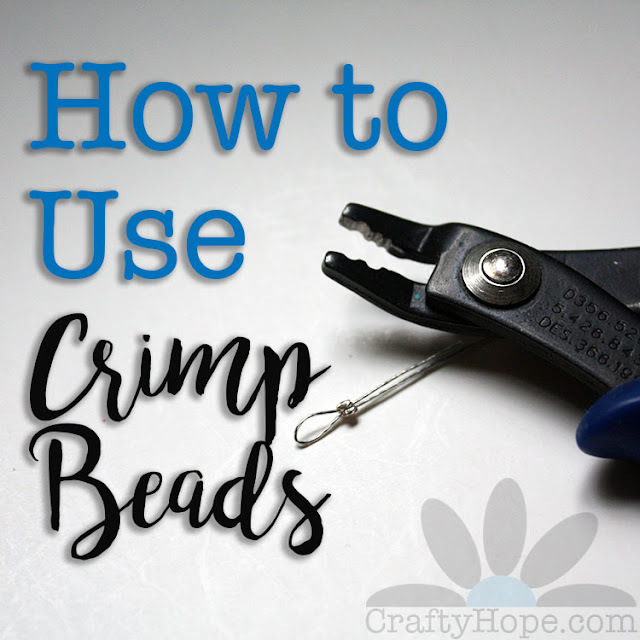 There was so much I could do with these beads that I set to work right away! Since I had decided to use the clasp in a piece of its own, I needed to come up with what beads would work with it. The copper clasp seemed to naturally fit with the small copper beads Andrea sent. In addition, I used the carved rose cinnabar, the topaz glass beads, and the small black wood beads from the soup. To give the bracelet a POP of color, I covered some wood beads with bright peacock blue tissue paper. Copper wire with a simple loop rosary chain connects the larger beads and black beads for the base of the bracelet. With the same wire, I made headpins to form the fringe of copper beads. With the extra headpins, I went made a pair of matching earrings. Coming up with a design for the fabulous Golem pendant gave me absolute FITS. The pendant itself is just amazing and I could totally see it simply hanging from a basic cord. But, the bead soup party is all about thinking out of the box. I played around with ideas for almost a week before I began to feel absolutely overwhelmed by it. So, I put the pendant aside for a few weeks while I thought on it. Finally, this is what emerged. I wanted to make the design simple enough to highlight the lovely pendant, but I also really wanted to play with the design. I 'framed' the pendant with a wood flower that I painted cream and yellow (like some of the flowers on the pendant.) From this layered focal spans two chains of beads. One is a wire wrapped chain of the red, orange, and yellow beads stacked together. The other chain consists of the green magnesite beads and black wood beads alternating on a rosary chain. I used a bit of lightweight metal to shape and dye some accent flowers. These are simply attached along the chain. A brass flower hook clasp closes the necklace. While I'm really liking the necklace, I almost think that the dyed metal flowers may be a bit much. It's possible that they may disappear from this design before too long. . . I really loved the ceramic red and yellow beads. After recognizing that I didn't want to work them into the other two designs and there were two of them, it was obvious to me that they would become earrings. Something about the color and stripe on these two beads makes me see them as the balls that seals (at a circus) would balance on their noses. With the addition of a few cogs, it has a steampunk circus feel to me. I really dig them! After those first three pieces were completed, I thought I was DONE with my bead soup (at least for a little while.) However, I started playing with some of my mixed media/collage materials and some chain. The passion charm (made from a Tim Holtz fragments tag and a vintage dictionary page) and the wood heart charm (coated with red metallic paint and Tim Holtz distress stickles) matched up perfectly with the frosted red beads in the soup. Paired with some acrylic faux pearls, I just adore the vintage-y femininity of this bracelet. 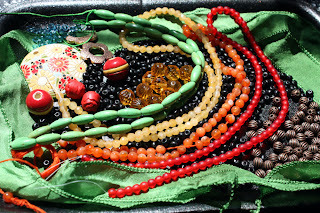 So those are my contributions to the Bead Soup Blog Hop. I still have a ton of beads (and the silk ribbon) to play with later. [Andrea supplied me with beads-a-plenty!! Thank you, Andrea.] If you haven't done so yet, please visit my generous partner Andrea Morici's blog to see what beauty she created (you can even pop over to her shop) and then hop along to the rest of the Party participants. Before you do that, a super big, huge, ginormous THANK YOU goes to the bead soup coordinator and originator Lori Anderson. I know this massive of a participant list has probably been a real pain in the. . . head. If we all close our eyes and wish real hard perhaps Lori will receive the blessing of plenty of pie for her efforts!! Seriously though, thank you Lori for everything you've done over the past month to facilitate this Blog Party. I appreciate it more than you know! Don't forget to leave a comment to enter my giveaway! Click on each name to go to their blogs. Beautiful job, Hope. You had so many beads to work with...and did a great job of making so many lovely pieces. The main necklace looks very nice on too...always a good test! Really love the Golem Necklace adding that flower behind the pendant really sets it off. Oh, I love the passion bracelet! It's so delicate! Fabulous job with the soup goodies you received. I love that copper set-the copper and the colors work great together! Love the necklace with the Golem pendant! I love how you layered the wood flower under the pendant! The passion bracelet is beautiful! Love how light and airy it looks and I love the tags you added to it. Awesome pieces you got going there! Terrific pieces. You did such a great job on your bead soup! 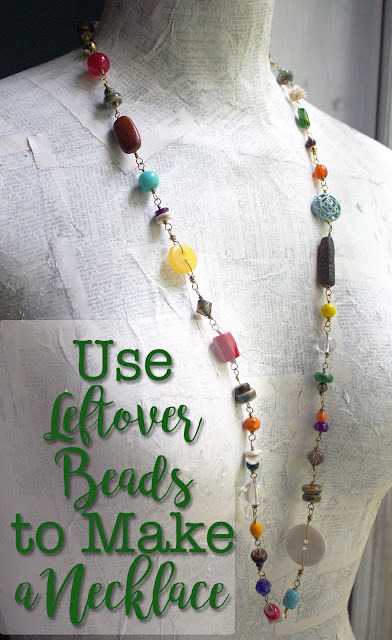 wow I love what you did with your bead soup! Such colour and beauty, I love the Golam pendant ~ 'tis beautiful! Lucky you to have received such a generous bead soup! All your pieces are lovely, and so different from each other. Thanks for the chance to win the bracelet. Wow Hope! All the pieces you made are gorgeous, but I have to tell you the Golem Necklace is a STUNNER!!! I love all those colorful flowers! Beautiful!! Wow, I love what you did with the wood flower and the focal. That is my favorite piece! Hope, these pieces are just beautiful! I LOVE that copper set, and what you did with the Golem pendant was just perfect! I also love that you chose the word "passion"- you just don't see that enough! Beautiful work!! That pendant is outrageous! I've never seen anything like it. Great work, and lots of it. Oh. My. That Golem necklace. Wow. I *love* how you accented that focal! It's just stunning. Now, don't get me wrong, the bracelets and earrings are gorgeous too!! I love that copper set...and would be honored to win it! yay Bead Soup Blog Party! Great job hope - you grew some beauties from that garden of beads! What a generous bead soup and what a fantastic job you have done,Hope! Your pieces are just beautiful, that Golem pendant is fabulous and to frame it with a wood flower - that is clever!I love the passion charm and the cogs you added to your earrings. Very nice, especially love the bracelet. Such amazing pieces! I really like the earrings with the steampunk touch! Perfect party fun! These are lovely. I like the idea of the wood flower with the pretty pendant it really works well. You created a great bunch of jewelry from your ingredients. Fabulous work! I love the copper piece, and LOVE how you handled the golem piece. Great job! Love your Passion Bracelet - such great color combos...and of course the Golem pendant and how you designed with it are simply beautiful. Great Job! We're all being pushed outside our comfort zones -- with amazing results! Hope, these are all wonderful! I love that you used turquoise paper over the beads on the first set, and I love the metal flowers on the second - the circus steampunk earrings are adorable, and the mixed media piece is perfect! I say you win! Wow, what a treasure trove you had to begin with. Love the blue, red copper set, the colors pop and the clasp is perfect for it. The colors pop in your necklace too, love what you have done with the focal. The other two pieces just as lovely. Bravo, great job! Oh my, I really REALLY hope I win the set. All of the work is stunning, but my favorite has to be the first set. Such rich colors set off with black and copper...perfect. Incredible work! I love what you created, all of it! The colors and textures are great, congrats! Oh Dear, you did really a lot with your beadsoup and every single piece is soooo beautiful. Wow, this is one beautiful piece. I love how everyone's ideas are so different. Way to go! What beautiful pieces you made! Love the Golem set and the cute bracelet! You're right though, that Golem bead is amazing, and I'd be hard pushed to decide what to do with it! Beautiful pieces! Love the Passion Bracelet! You made lot of fun pieces with your goodies. Very nice! Oh Man what a treasure trove you received. And the amazing creations you have made. OMG OMG OMG that Golem necklace. SOOOO much love there. Better than pie. And I love what you're giving away but it wouldn't be fair to give to me, but good luck to everyone else! I like how you divided the beads and worked along a theme in each set. Really like the circus earrings. Positively gorgeous! I really like your little metal flowers whether you leave them or use them for something else, they are beautiful. Beautiful Pieces, I love Golem necklace the best but they are all outstanding. I like the bright blue with the copper. Very pretty. Wow, beautiful pieces! I just love your Golem necklace, gorgeous. You designed some beautiful creations with that huge bead soup! WOW! Awesome job! I REALLY like what you did to make your focal POP!!! I never would have thought of that but it really works. I kinda do agree about the metal flowers although I really like them alot. The circus earrings are neat too!! Boy, you were sure busy! I love the items you made. They're just lovely! Love the other pieces too, but the passion bracelet is my favorite. Wonderful pieces! That Golem necklace is to die for...wow! That Golem pendant is amazing...well, EVERYTHING is amazing...the tissue-paper-covered wooden beads... the textures and colors. Inspired! Love all the pieces you created but the steampunk circus earrings are my favorite. YUMMY SOUP! Fantastic fun colors! Your pieces are really pretty :) How fun!! Hope, you have truly outdone yourself with your gorgeous Bead Soup pieces. I have to say that your first necklace is one of my favorites that I've seen so far...it is such a great example of thinking out of the box. I'm not sure what I would have done to really showcase that Golem focal as it was so pretty on it's own. But the the way you layered it was so clever and really draws attention to it. And the mix of colors going around the two strands is so beautiful!! oh, you had FUN! What wonderful pieces, all of them are so different. I really like how the flower one turned out - modern and whimsical and romantic at the same time. I like all pieces. But the thing you made with the Golem! So great!!! You really lucked out to have Andrea as your partner. She was as generous as Julie. I really like the Golem pendant and what you did with it. I esp like the circus steampunk earrings. They really appeal to me, color and theme. We got so lucky to be paired with the Beadaholique gals. I can't believe how many pieces you made from the Soup! I love the Golem necklace. I agree with an earlier poster that it is frequently tough to do anything to a pendant for fear of distracting, but I love how you layered it. You got some awesome soup! You rocked the Golem beads, some of my favorites! Hope you enjoy the hop! Very nice! Love what you did with the Golem piece, and the bead and chain combination on the passion bracelet is perfect together. I actually really like the metal flowers on the necklace. They are a pretty variation on the flower theme from the fabulous pendant. Great wrok! That was one big soup mix you had to work with!!! I would have drown in all the possibilities, but you? A very strong butterfly stroke all the way! Absolutely beautiful! All of your pieces are gorgeous! I love how you added a POP of color w/the tissue paper, so clever!! Hi Hope, I love your creations so beautiful! The bracelet is pretty with the bright colored beads, dangles, and copper, the matching earrings are just lovely. I really love what you did with the necklace very creative how you showcased the Golem pendant and I like the little clusters of metal flowers they give the necklace a bit of uniqueness. I agree with your thoughts on the earrings, the beads do look like the balls seals play with, they are so cute! I adore that bracelet and would love a chance to win it. I love the headpins you made for the fringe. And the copper clasp really sets it off. The beautiful focal you really set off with the little flowers and all the other beads. And your steampunk circus earrings are so cute and funny. I can totally see seals playing with them. Wonderful soup. Beautiful!!! I especially love that second necklace! Great work! what a great job you did with your bead soup! You are a great jewelry artist! The necklace with the Golem focal is FABULOUS!!! Wow! You made so much! I love the necklace with the Golem pendant especially. Wow, you really went all out on this. But then you had an incredibly generous soup to play with! I love all of your pieces, but especially the necklace you pulled off with the golem bead. Hope you rock!!! What a great grouping of jewelry you designed with your soup!!! I love how you attached the wooden flower to the Golem pendant very clever! Great job with all of your pieces! I really like the mixed media charms on that last bracelet. You made so much soup! Incredible work, love the Golem necklace and i really like the metal flowers, think they would be great as earrings too! Love your necklace but you always do good work! What a delicious soup. I really like what you did with the first bracelet. So bright yet so earthy. Totally my style. SO many pieces and so many styles Loved them.. such creativity! I love how many pieces you got out of your soup and such great variety. Great work! Tons of creativity. I bet you hours of work! Great job. Loved the addition to the Golem focal, but best of all, I loved your telling of the process of frustration and resolution! Wonderful result. beautiful work :) The last bracelet is particularly nice...I think it's because the straight forward color and size of the beads gives it a more simplistic look then the others, which lends it a bit of an elegant look. Your Golem Necklace is amazing!!! I really love what you did with the pendant. That wooden piece you added worked perfectly. And that you made the flowers going up the back part of the necklace. WOW...what a fantastic necklace, love how you created the pendant. So pretty - that golem pendant is gorgeous and you worked it perfectly. Delicious soup! Lovely jewellery! I especially fell for the Golem necklace and Passion bracelet. Love the style and colours in the Passion bracelet! You made lots of beautiful items. They all look great. All of your pieces turned out really gorgeous! I love the Golem necklace! I really like the two strands of beads and the way you created them. Beautiful work! A very lovely and creative soup! Well done! Wowzer! I agree that the clasp and the focal were both too fabulous not to have their own pieces. Each piece is beautiful, and I really like the experimentation you put into complimenting the Golem pendant. The metal flowers are very cool -- they would be fab on their own. Woo hoo - take a bow! All of your pieces are lovely, but the flower pendant necklace is particularly nice. The beaded chain is gorgeous. You were so productive! I am so impressed with the sheer volume of your creativity. As soon as I set eyes on the bracelet with the copper clasp and blue beads I loved it! Then I read how you made the blue beads and loved it even more. How creative! love your soup! you had some great ingredients to work with. Love how you layered that Golem pendant. Looks beautiful! Those earrings are awfully cute, too! I will say you really 'outdid yourself, girlie' with all this bead soup goodness! I love it all, especially love the passion bracelet and the Golem pendant necklace. Personally, I like the metal flowers and hope they don't go away! :) Have a great week!! Oh Hope, you did a wonderful job!! My favorite piece is the first necklace, it is so rich and colorful and you arranged everthing so perfectly together! And I still love all kinds of writings in jewelry (though you see it a bit too often, lately...), so I am in line with the pasion bracelet! Great job! Wow look at you go with so many beautiful designs! I think it's wonderful you are giving away such a pretty little set! The Golem necklace, OMG! I LOVE it! I love the gorgeous pendant, the metal flower cups filled with other beads and the multi-strands! Wow! Love the simple steam punk earrings. I love the passion bracelet too! I love that you used an old dictionary like I did for my piece :D Great minds think alike! It is so great that you got your soup very early and you got to play with that fantastic soup you got. All your pieces are grand, but I really like the last bracelet. So feminine. Well and the first one. love the idea of wrapping tissue paper on that first bracelet. Very Nice soup! I especially love the Golem Pendant Necklace. Great job! What a beautiful collection. I think the bracelet is my favorite, although I really like the necklace and earrings too! Really nice combination of colors and shapes. GORGEOUS! I love the first set with the copper, I adore anything copper and these colors are delis with it! The second set with the pendant...delightful! You did a beautiful job with your soup. Gorgeous work, really loving the bracelet too! The wood flower if such a fun addition - love their pendants!!! Beautiful pieces! Really like the way you backed the pendant. Excellent work! Love your soup...all the yummy beads, and the focal flower is beautiful! All of your pieces are perfect, but that Golem necklace is stunning, I love all the colors you chose-beautiful work! look how much soup you made!!!! The golem piece is my favorite and all of the beads and layering really make it a wow piece! Nice job on all of them - and I like the assymmetry of the necklace side dangles. What a great job! Hard to choose a favorite! Very impressed by your versatility. I really like all of it, but you know I'm a Golem girl, so naturally I'm drawn to that one the most. I like the flower "frame" you gave it - very clever. As for the dyed metal beads, I was so curious about them (because I love them) that I didn't even think that they might be too much until you mentioned it. I still don't necessarily think that. Is it just that super thin metal that comes on a roll cut with scissors or some kind of die cutter and alcohol inked? I really liked them! How much fun you had with the bounty of your soup. Really like the Passion Bracelet and the Golem Necklace. Your metal flowers are fantastic. You really went all out!! Lovely work!! It certainly is a gorgeous focal all on its own but I love the idea you came up with to frame it. I love the colours you used in the necklace too. You've been busy!! What wonderful soup you had to play with! 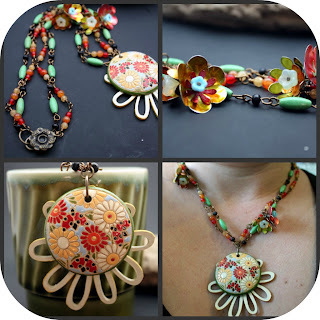 I just love that necklace with the wooden flower - you did a wonderful job with the focal and the design! And your last bracelet is delightful! you got fabulous soup and you made some fabulous pieces! the bracelet is gorgeous! The little earrings that look like circus balls are adorable. Painting the flowers was a great touch AND I love the wood flower behind the focal. What a great addition I never woudl have thought of. Very nice work! I particularly like the bracelet with its vintage look. I love what you did! Your work is very inspiring! All I can say is FABULOUS!! Each piece is beautiful. I love everything you made!! Your work is beautifull!!!! You're truly a jewelry designer! You really wowed me with your pieces. Thanks for your nice comments too. All I can say is WOW!!! Love it a lot!!! That was one amazing pot of soup and I must say you did it justice. The idea of framing the golem necklace and the pairing of colors is so very lovely. Great job!! love the golem necklace! so pretty! and how nice that you had so much leftover that you could make other stuff! Wow! You had a lot of soup to work with and you did an awesome job. Love the golem necklace! Very pretty! All of your designs are great but I am partial to copper and love the copper set and also the steampunk earrings. Wonderful job. Well, I may be the last to comment, but maybe my name will land on top of the heap when you draw names! I must say that I really love that copper set and would enjoy the chance to admire all those beads close up! I'm really intrigued when you talk about wrapping some of the beads with blue tissue paper. Thanks for sharing the lovely things you made! I'm still blog hopping around! The party is still on!! Love your pieces and your descriptions. How did you get the three photos in one like that? Photoshop? Ohhhh, these are all GORGEOUS! I am floored by your creativity. Each piece is so unique! The Passion bracelet is my favorite, absolutely lovely! Wow - nice assortment of beads and colours you got to play with! Well done, your finished pieces are just beautiful! Oooh fun! You made a ton of stuff with your soup. I really like the simplicity of the earrings and the color selection you decided on for the pendant necklace. I love your designs! How you mixed the colors and materials is so cool - I love the first necklace the most!! You had a great idea framing the pendant with a wooden flowers. It completes it perfectly. I just loooove the necklace you made. Absolutely amazing jewellery, what a treasure trove you received. Fantastic soup mix plus a great designer = amazing jewelry pieces. Really Soup-er job! I love the "antiqued vintage" look you achieved with your jewelry. You did a wonderful job of putting your personality into these beautiful pieces! Thank you for your wonderful comments when you visited my blog. What a big soup you had to work with ☺ - but you did an amazing job, love them a lot. Hope - that was indeed a fabulous portion of bead soup you received! I see what you mean about the clasp and the pendant. The copper set turned out so cheerful and happy, and the blue beads you made added the perfect finishing touch. The Golem Necklace reminds me of a late summer garden - the colors are so harmonious. The steampunk circus earrings are TOO coolio - love those! And...the Passion bracelet is divine - I'm loving the charms you made and how you pulled it together. V-e-r-y nice!